Although Horizon Carpet, Upholstery, Tile & Grout Cleaners loves performing all our services for our valued customers, we must admit stone surface cleaning is our favorite one of all. If you’re wondering why, the simple answer is we love the functional and visual benefits the homes and businesses of our customers receive from our stone cleaning services. More importantly to us, our customers love the service and really enjoy the results. 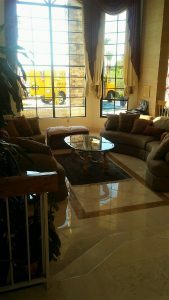 Throughout the Phoenix and Scottsdale area, we offer a variety of stone cleaning services including travertine, saltillo, marble, slate and other natural stones. 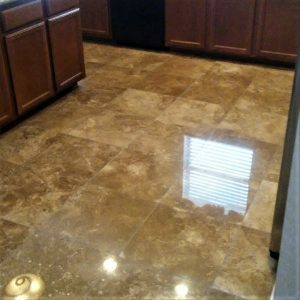 In addition to cleaning your natural stone, we also polish it, seal it and hone it, and we can even do it without using waxes or using floor finishes. Also, we offer high shine and matte finishes, which simply means “not shiny” if that is what you prefer. Undoubtedly, there is a wide range of benefits to having stone flooring in your home or business. For starters, natural stone tiles are visually appealing and have a distinct look, providing your home or business with an extra bit of character. Moreover, stone floors are quite durable, and always seem to be in vogue. Nevertheless, like all nice things, it’s essential that you properly maintain your stone flooring, as the surface could suffer from a variety of stains, including, but not limited to oil stains, liquid stains, paint stains, water spots, and/or fire and smoke damage. Moreover, there’s always the chance for scratches to appear at a moment’s notice, making it prudent for you to have your stone surface cleaned. 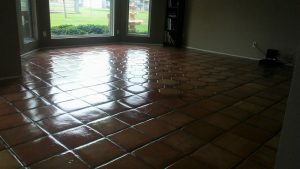 Over time, stone floor surfaces can lose their luster and grout can turn to unsightly colors. That, plus the accumulation of everyday debris and typical wear and tear necessitates that you have your stone surfaces cleaned to ensure they maintain the look you want. 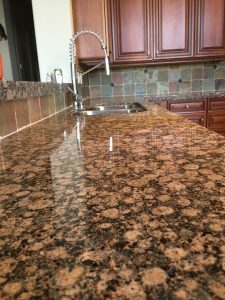 Assuredly, having your stone surfaces professionally cleaned will help reinvigorate the look and luster of your stone surfaces, while also eradicating unwanted scratches, dirt, debris, stains, grime and tarnishes. Horizon Carpet, Upholstery, Tile & Grout Cleaners goes above and beyond to make sure the stone surfaces in our customer’s home or business looks marvelous. We start our process by focusing on the major treatment areas and mapping out our plan. Next, our technicians will pre-seal to help keep the surface dry, right before we begin honing the surfaces. The honing consists of our carefully selected cleaning agents that are designed to eliminate scratches and hide the wear and tear of everyday use. After that process, our technicians will rinse the honing, and use our equipment to make certain your stone surfaces have a shine that puts a smile on your face. Shortly thereafter, we’ll add sealant that will protect your stone surface against future stains, scratches and more. Ultimately, our technicians will work tirelessly to have your stone flooring and surfaces looking pristine and vibrant once again. What’s more, a professional cleaning will save you time and headaches, and help you keep up with your own routine maintenance. As well, having your stone surfaces professionally cleaned will play an important role in protecting your overall flooring investment, helping the resale value of your home later on down the line. In addition to our stone cleaning, we offer a variety of other services near Scottsdale, including carpet cleaning and repairs, tile cleaning, grout recoloring and upholstery services. If you’re looking to improve the look and functionality of the stone surfaces in your home or business, Horizon, Carpet, Upholstery Tile & Grout Cleaners is here to help. For more information or make an appointment, please contact us today at 602-404-8064.